Contact Deborah to discuss how she can tailor a presentation for your Group! Diet has a major impact on health but many people have trouble sorting through all the conflicting nutrition information found in the news, internet sources and popular publications. 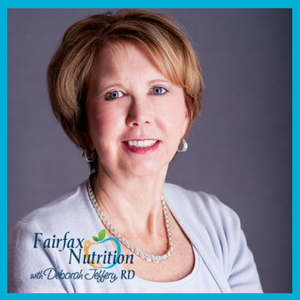 As a registered dietitian and nutrition expert, Deborah presents science based information about diet and health. Each presentation she offers is packed with practical tips and strategies to inspire participants to take action. The 60 minute presentations include PowerPoint slides, 10 minute Q & A and handouts. The presentations are ideal for corporate lunch & learns and community groups. 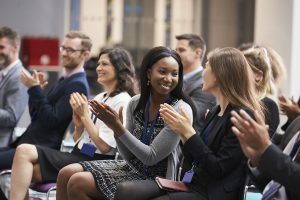 Below is a list of commonly requested presentations and programs. Foods and lifestyle to promote a healthy heart. The “good” fats to include in the diet and the “bad” fats to avoid plus the fitness numbers that everyone should know. Focuses on 10 lifestyle changes that individuals can make to promote better health, i.e. increase physical activity, maintain a healthy weight, get an adequate night’s sleep. Participants learn to determine their recommended weight and calorie needs and to identify lifestyle & diet changes for weight loss. How to read food labels and to make the best choices at the grocery store. Guidelines to assess the calories, sodium and fat in restaurant meals. How to make healthy selections when eating out. Rate your food intake to see if it meets the criteria for a healthy diet. Discusses common nutrition advice and determines if it’s fact or fiction i.e. “I should avoid fruits because the body metabolizes them as sugar” and “A low carbohydrate diet is the best way to lose weight”. Understand the role that nutrition and exercise plays in brain health. How your dietary choices influence your mood. How to avoid dinner table struggles and still provide your child with the nutrition they need. Participants meet each week for one hour meetings during the 12 weeks with the goal of healthy weight loss. Participants are weighed-in at each meeting and a variety of topics are presented and discussed. Topics include Eating for Satiety, Navigating the Grocery Store Aisles, Emotions & Eating, and Healthy Recipe Modifications. Deborah has teamed with an ACE certified fitness instructor and personal trainer to present a 2 hour workshop on the unique nutrition and fitness needs of women. Each participant receives a workshop notebook with practical tips to increase energy, improve bone health, avoid belly fat, maintain a healthy weight, and much more. One-on-one nutrition counseling sessions for employees in 15 to 30 minutes sessions at your location. In-person presentations are limited to the DC metro area. Contact Deborah to inquire about booking a presentation for your group.